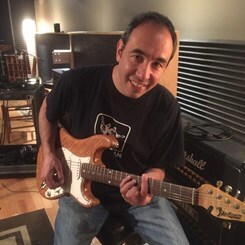 Guy Fenocchi is a professional guitarist, and guitar / bass instructor originally from Central New York. He holds an Associate’s degree in classical guitar from Onondaga Community College, and a Bachelor’s degree in Jazz Studies from Ithaca College. As a music educator Guy has thirty years of teaching experience, varying from private instruction to classroom environments. He has also been involved with Day Jams summer camp ’06’, and co-director for Camp Jam ‘07.‘ Guy’s publications include his own book Guitar Companion and Supplements Workbook and Let's Jam Jazz Standards. He is also a co-author for the Set The Stage jazz combo series by Randy Hunter. As a performer, he has toured throughout the East Coast and Canada with various groups and performers. Artists include The Drifters, Clarence Clemons, Big Bill Morganfield (the son of Muddy Waters) and many others. He has also appeared in the Stan Rogers folk fest, North Atlantic Blues Festival, Syracuse, Atlanta, and Montreal Jazz Festivals. Guy currently performs in the Atlanta area as a solo Guitarist, and with recording Jazz Group Metro Quest. My philosophy is that I teach music, not just the instrument. I incorporate theory, musical form, transcribing, ear training and overall knowledge of the instrument. With every student, I breakdown the fundamental elements of melody, harmony, rhythm and improvisation. I incorporate standard notation, as well as tablature and chord grids. My students will achieve the qualities of a musician, not just an instrumentalist. Request Lessons with Guy today!